We could claim our three visits to Central Food were rooted in some sort of well-meaning integrity before doing a write up about the spot, but really, nobody (least of all us) will buy that. Frankly, the real reasoning is pretty simple: We like Central Food. A lot. It reminds us of Sage's in Olympia, at least as far as the food goes, and most everything seems to have fallen in place here, even this early on in the game. Walking in, the interiors are minimal and utilitarian, draped in a nice color palette. Everything from tables to coffee cups are heavy and sturdy. A well thought out interior, which might not sit 100% with those who for whatever reason are into shabby chic and its ilk, but it's the type of space we enjoy. The menu is seemingly an eclectic mix of various styles of cuisine, yet it all comes together in the ways the dishes are prepared. Meaning the food is good. For the most part excellent. The Scotch egg is almost a meal in itself -- a lot of sausage meat wraps around the egg -- and plenty flavorful. The mustard sauce was actually a bit too spicy for my liking, but there is little need to dip the egg in it anyway. The flavors of the egg speak perfectly well without it. The lamb skewers has a nice kick to them, served with a very good tzatziki style sauce. 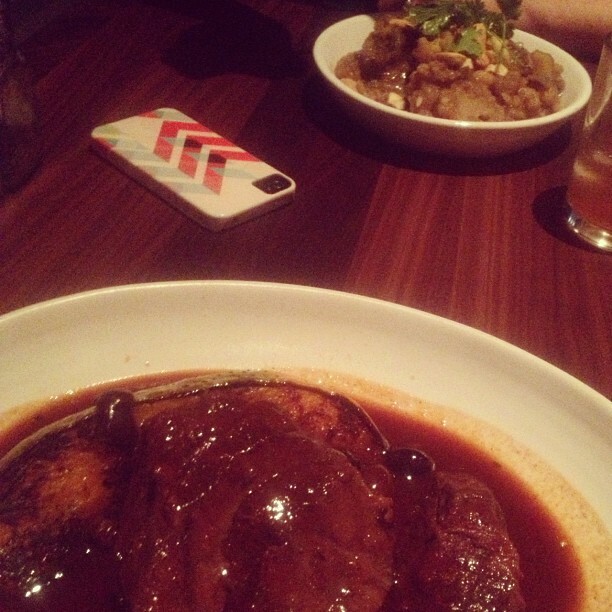 But of all our dinner items, I'd still say the beef cheeks dish was the one that really hit it home for me. They're served perfectly tender in a sauce that has distinct hints of red wine to it. The depth of the flavors is pretty spectacular, and the roasted pumpkin complements the beef nicely. I thought, and still think, this is a stellar dish. That's not to say the vegan curry is a bad alternative. The cashews are a nice addition to the cauliflower, and the cilantro adds a good, earthy kick to the palette, as cilantro tends to do. In retrospect we should probably have told our server about it, but oh well. We chalk this one down to early teething problems. Finally, the breakfast, with service starting at 7am, was again of high quality. The Tchoupitoulas -- say that three times fast -- is flavorful, well flanked by an andouille sausage. The baked beans, too, are excellent and not too sweet, and the fruit bowl is a good, semi-sweet option for those who want something a little lighter. I could go on here... The service is friendly and professional -- maybe a bit slow as far as getting the food out, but it's still early goings -- and the cocktails are excellent. Great view of the river, obviously, and the prices are very reasonable. Really, we can't think of a reason why you wouldn't want to at least try Central Food for yourself. We've been waiting for a spot like this to open in Spokane for a while; a restaurant that serves truly excellent and creative food at a reasonable price. We had three great visits to Central Food, a few niggles aside. We're excited to see what the future holds for it, but Central Food's beginning is very, very promising. Do you recommend Central Food? Make your voice heard!